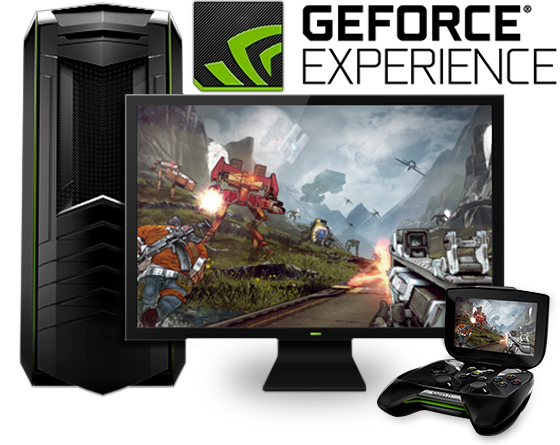 NVIDIA GeForce Experience is a powerful application that is especially designed to provide you with a means of having the best settings for your games as well as the latest drivers from NVIDIA. Keep Drivers Up To Date. The GeForce Experience application automatically notifies you of new driver releases from NVIDIA. With a single click, you’ll be able to update the driver directly, without leaving your desktop. GeForce Experience connects you to NVIDIA’s cloud datacenter to download optimal game settings tailored to your PC, CPU, GPU and monitor. This means you always get the best image quality while maintaining great performance. Plus, a built-in interactive screenshot viewer tells you about each setting and its benefit. Share your Greatest Gaming Moments. ShadowPlay automatically captures your favorite gameplay moments – with minimal impact on performance – so you can share them with friends. It’s fast, simple, and free! You can even take advantage of NVIDIA Kepler® architecture to instantly broadcast your gameplay in an HD-quality stream through Twitch.tv. With the help of GeForce Experience, the NVIDIA SHIELD™ gaming portable gives you the power to wirelessly access your GeForce® GTX-powered computer from the comfort of your couch. Play your favorite PC games on a full-size controller with ultra-low latency thanks to SHIELD’s game-speed Wi-Fi and the blazing-fast performance of GeForce GTX GPUs. The software supports over 30 titles at this time and provides a user friendly and nice looking interface that helps users select the game or driver update and view the corresponding details then launch the game or driver installation. · Desktop GPUs: GeForce 8, 9, 100, 200, 300, 400, 500, 600 Series or higher. · Notebook GPUs: GeForce 8M, 9M, 100M, 200M, 300M, 400M, 500M Series or higher.